Laser retinal Scan - OCT.
An OCT scan is similar to an MRI or CAT scan for the eyes. OCT can image in 3D allowing us to see, sometimes for the first time, problems within your eye that could not easily be seen before. The retina can be damaged by many common diseases like glaucoma, diabetes and age related macula degeneration. Damage to the retina can lead to visual impairment or even blindness. The value of measuring visual fields is as an aid to the diagnosis and monitoring of conditions such as glaucoma, strokes, effects of medication on visual sensitivity and more. 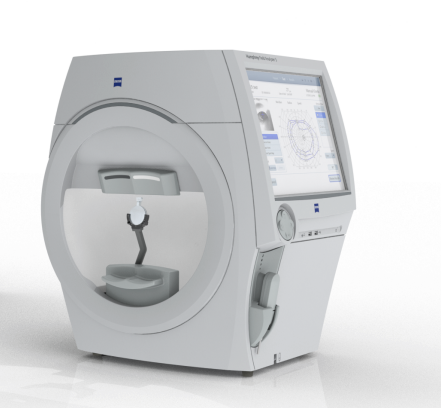 This is the only machine to use to assess visual fields.